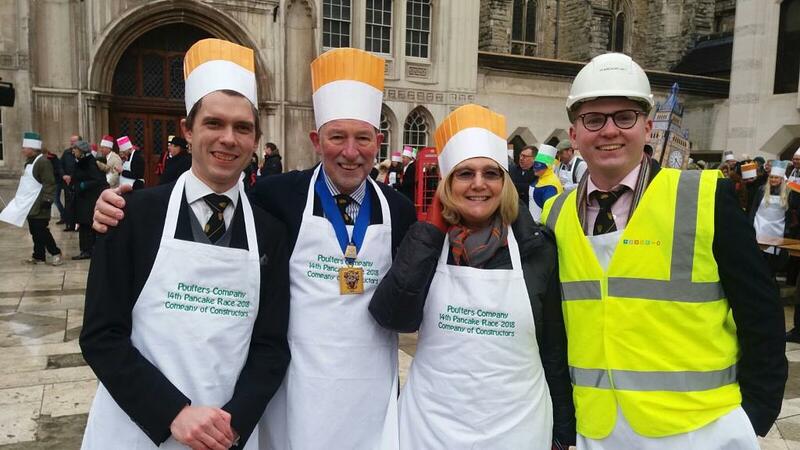 This year the Company has again been invited to supply a team for the Annual Inter-Livery Pancake Races, which are organised by the Worshipful Company of Poulters. Our team for last year is pictured above, and we are looking for four volunteers for this year’s race as well as other members who are able to turn up as spectators and cheer us on. Along with the Master we need a Liveryman, a lady member and one of our younger members (either an Apprentice or a Yeoman) to form our team, and we are currently putting a team together to compete in this year’s races, but they will need other members of the Company to come along as spectators, and cheer them on vociferously, so we encourage all members to join in the fun. If you would like to join in the lunch after the races, which will be held in the crypts of the Guildhall, then you should pre-order lunch through the Poulters’ Company. Unless the lunch is pre-ordered you will not be able to take lunch as lunch tickets cannot be purchased on the day. To pre-order lunch at a price of £30, please email the Poulters’ Company at poulterspancake@gmail.com to reserve your place(s) and either make an electronic transfer of £30 per person to the “Master Poulter’s Pelican Trust – Royal Bank of Scotland Sort Code 16-00-15 Account No 23167762 or send a cheque made payable to “The Master Poulter’s Pelican Trust” to Elizabeth Garner, 9 Chawton End Close, Four Marks, Alton, Hants. GU34 5BF. The pre-ordered Lunch Tickets will be available for collection from a new check-in desk at the races, and they will be required to be surrendered on entrance to the Guildhall Crypt. If you are attending, do please email the organiser so that we know to look out for you on the day.